When my mind drifts, as it often does, it drifts to cycling. Specifically, to being far and afield, and going up a monster climb. Unfortunately, the reality of my current fitness precludes me from realizing my mind's drift. Still, North San Diego County's a pretty hilly place, as is evidenced by the Queen Stage of the 2009 Tour of California, and hills are a way of life for the local cyclist. Yep, the I-5 shoulder. The collection place of the debris spewed from a zillion cars which is given to us cyclists to get from here to there. It is very satisfying, on the verge of smugness, to climb past all the stuck-in-traffic vehicles, particularly if one of them is the shuttle bus I would be riding on if I weren't cycling. 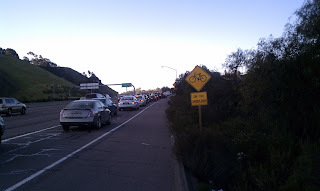 However, the climb is relentless, and there's a merge to deal with at the top of the Genesee off-ramp. Then, the route to and across campus still keeps going up and up. If I ride the 30 miles from home, there's about 1000 feet of climbing, but this 3.5 mile ride has 500 feet of it! Also, you may note that this picture shows the ride to be in shade, and since the climb starts right from the train station with no warm-up, and since being a Southern Californian means I have no tolerance to cold, this is a real challenge (but not really an existential one, thank goodness. If it was, I'd miss a lot of work). Despite the near-Arctic conditions, however, I've been able to endure and even thrive on this. It bodes well for future endeavors, but I still gotta figure out how to take a picture on the downhill side of the day to show you what that looks like. I can assure you that zipping away from work at 40mph in the sunny late afternoon looks a lot better than the above!